The project aims to establish protected piped water supply to 36 rural households benefiting 271 people in Laxmipur village at the Gajapati district in the state of Odisha. Laxmipur is a Panchayat village in Rayagad block of Gajapati district. The village has 36 families of mixed community. Being a Panchayat headquarter , the village is connected by road and has a primary school , an anganwadi centre and a health centre. 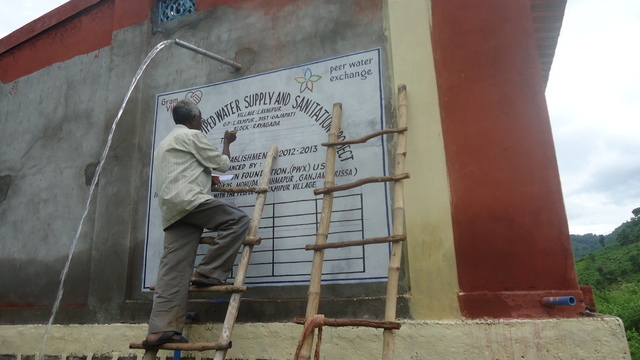 Gram Vikas’ Koinpur project started operations in other tribal villages of Laxmipur Gram Panchayat some years back with sanitation and bathing room with piped water to each household. It was a challenge considering the tough terrain and the poor economic condition of the tribal communities – as they had to pay quite a significant share in establishing the hardware. But once the water flowed to the village, people were overjoyed and slowly small but significant changes are visible in these villages- improved backyard vegetable gardens, better health and hygiene conditions, more regular schooling and economic activitiy by accessing credit from financial institutions. It was a challenge to convice people of Laxmipur village to implement a similar project- the community did not feel the need , was not interested and expected the government to establish the facilties without having to bear any part of the cost. However when over 80% of the villages under this Panchayat were enjoying piped water at their doorsteps, the women of Laxmipur were hauling headloads of water daily. It was also difficult for them to answer nature’s call at will due to lack of dicrete places- the market place being nearby, most often there were people around during the day. This prompted the women of Laxmipur to approach Gram Vikas’ Koinpur office and seek help for the programme. Once they heard the conditions – establishment of corpus, sharing nearly 60% of the cost of individual toilets and bathing rooms, maintenance for water etc, they had a series of meetings to sort out these conditions and came forward with their plan to Gram Vikas. After this , the construction of toilets and bathing rooms took place– with the entire village coordinating the collection of local materials. Since the stones for the construction work was not available locally, it had to be bought from a neighbouring area. This led to each family contributing on an average of Rs. 8000 . After the toilets , the water supply was initiated. The plan was to establish a gravity fed water supply system. The community had identified a spot and dug a small well to see if water was available . Unfortunately, the water was insufficient and the source dried up in the scorching heat of the summer. The challenge was to identify a new water source now! There was an existing open well in the village , but the water would be insufficient during the summer months. The Village leaders selected another spot to dig a new well. Finally a team of well diggers were hired to dig the well which is 36 feet deep. The well yielded good water even in the summer months. Water is being pumped to a 10,000 liter elevated water tank which is sufficient to supply 24 hours of piped water. This change in design has had an implication on the budget and there has been an increase in expenditure for this project. Presently each household has taken a water connection with a water meter so that the tariff will be equitable- depending upon water use. Laxmipur’s initiative has motivated the remaining two villages- Jhirjira and Tendi under this Panchayat to take up the programme where the work has already started. In another year the Gram Panchayat will attain an open defecation free status on the GV model of sanitation and water.